Although its original emphasis was fuel treatments and industrial chemical water treatment, Kenneth J. Edwards, Sr. had the foresight to discern that harnessing nature to clean the environment with safe and natural bacteria would expand beyond the millennium. When Mr. Edwards, Sr. died in 1990, his heirs took over Alken-Murray Corporation and designated a greater proportion of the company's budget to marketing and developing the environmental products. Current company President and CEO, Valerie Anne Edwardswas always labeled either a visionary or an eccentric, depending on the viewpoint of the observer. Miss Edwards grew up on a Thoroughbred racehorse farm and saw all aspects of life as part of a continuous process with astonishing interconnections. At age 13, she began a small business, breeding American Shorthair cats. By age 17, she was elected a vice-president of the National Breed Club, (they never questioned her age). She won honorable mention in a science fair for her project on the genetics of the silver color in cats, disputing the textbook theories about the origin and mode of inheritance of this color. Today textbooks on cat genetics agree with her theory about the responsible gene and its dominant behavior. Many of her articles on cat history and genetics have been published, republished and cited in other works. Her database of 7,000 cat pedigrees, dating from the mid-nineteenth century, has been shared around the world. Upon joining Alken-Murray in 1990, Miss Edwards passionately devoted herself to studying the genetics and application of bacteria to pollution control. She was determined to see the Clear-Flo®product line advance, expand and improve while seeking new markets for the Even-Flo® formulas. Colleagues have described her penchant for intense research as tenacious, determined, obsessive or even relentless. Since 1992, Miss Edwards has been listed in The International Year Book and Statesmen's Who's Who, which is the original and most prestigious of the Who's Who reference works. Miss Edwards is a member of The American Society for Microbiology, Water Environment Federation , The Society for Industrial Microbiology, American Association for the Advancement of Science and The National American Shorthair Association. Miss Edwards biodegradation pathway for Propachlor has been entered in the award-winning, internationally famous UM-BBD Database. Her most recent accomplishment was the discovery of a new species of gram-positive, spore-forming, heterotrophic Bacillus that oxidize sulfide, with one strain of the new species matching the simultaneous oxidation of sulfide and denitrification performance of Thiobacillus denitrificans. Dr. Frederick M. Cohan of Wesleyan University, renouned expert in species of Bacillus, did the specialized DNA probe work to prove that this is indeed a new species. Dr. Cohan and Miss Edwards will jointly author a scientific paper to detail the unique traits of this new species and to officially name it. Alken-Murray has added three strains of the new species to a variety of products in February 2003. Complimenting Miss Edwards' leadership and talents are the two vice-presidents; Kenneth J. Edwards, Jr. (Vice-President, MIS), and Ms. Claudia P.Velasco (Vice-President, Management),. Mr. Edwards has a background in chemistry, photography, graphics and computers. Ken writes key programming, creates the look of promotional material, trains staff and distributors in the use of his programs, oversees quality control and shipping, and double checks projects for chemical validity. His experience working as a physical science technician and chemist at the National Institute of Health, Vice-President, Technical of RT Color Laboratories, Vice-President of RT/Omega International, and a chemist at Science Applications International have broadened his scope of knowledge, all of which has been put to use in his position with Alken-Murray Corporation. Mr. Edwards has been listed in The International Year Book and Statesmen's Who's Who since 1992 and is a member of the American Chemical Society. The bilingual Ms. Claudia Velasco, with a background in management, microbiology and laboratory applications, assists Miss Edwards with research and development, communicates with Alken-Murray's Spanish-speaking distributors and clients, and travels to locations requiring on-site technical assistance. The current company vision puts the focus on responding to the clients' needs with unique and cost-effective solutions. This management ideal is reinforced by intelligent and imaginative distributors who assist the clients in the field. The additional board members balance the viewpoints of these key officers and support the company's vision of integrity and innovation. The Alken Clear-Flo® series of microbial formulations increase fish and shrimp farm yields by reducing excess organics, ammonia, and other toxins, thus preventing off-flavors and off-odors. Other Alken Clear-Flo® formulations were developed specifically to target industrial and municipal activated sludge waste water treatment for enhanced removal of BOD/COD, TSS, odors, toxic chemicals and oil contamination. Other formulas were devised to treat anaerobic digesters, grease traps, septic tanks, rural lagoons, composting, animal production facilities, hydrocarbon spills, ethylene glycol, and many other applications. The popular and effective Alken Enz-Odor® line includes products which solve odor problems from kennels and catteries to zoos, landfills, and dumpsters with their surrounding ground areas, binding mercaptans, hydrogen sulfide, ammonia and amines while the source of odors is degraded by natural enzymes. Alken® Treat-A-Loo provides high-quality, low-priced treatment for mobile and portable toilets. At times a solution includes products from two or more lines, for example Alken® 862, from the chemical line, is employed to separate oil for recycling from an oil-in-water emulsion, followed by the application of Alken Clear-Flo® 7036 or Alken Clear-Flo 7008, from the microbial line to the remaining water to remove all traces of remaining oil, so that the water may also be recycled. Jointly, Alken-Murray and Solutions Chemical Consultants offer ten outstanding emulsion and liquid copolymers which work well with the microbial products to maximally improve industrial and municipal clarifier operations and, working in co-operation with our microbial formulas, provide rapid water clearing for lakes and ponds. The Alken Even-Flo® line of wholly organic fuel oil conditioners dissolves sludge, eliminates stratification, emulsifies or demulsifies water (depending on which formula is selected), suppresses slag and corrosion, improves combustion, decreases maintenance costs and air polluting emissions, with applications in both land-based and marine installations, where fuel oil is used to generate power. Alken Murray offers superior Alken® organo-metallics to satisfy bids which specify them. Alken® PDE 903 cold-flow improver keeps diesel engines running in cold temperature conditions and provides vital lubrication to help maintain clean engines. Alken Even-Flo® 910S fuel conditioner provides maximum combustion of diesel fuel and prevents engine corrosion in trucks and heavy equipment year round. Most Alken® additives address the consequences of microbiological growths in the aqueous phase of water-contaminated fuel oil while still others provide solutions to the problems arising from burning coal as a fuel. 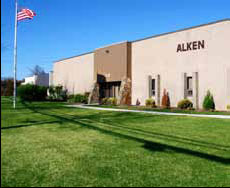 Alken-Murray still manufactures water conditioning chemicals for use in cooling towers, closed loops and boilers to combat scaling, corrosion, pitting, deposition, and bio-fouling as applicable, to insure increased operating efficiency, longer equipment life, and reduced maintenance cost while meeting EPA regulatory standards. A proven Alken® formula for cooling towers comprises non-polluting molybdate (in place of EPA-banned chromate), polymeric dispersant, and an alkalinity builder, blended for either soft or hard water application. Although Alken-Murray relinquished its EPA registrations for biocides, an alliance provides high-quality EPA registered duplicates of the old "V" line of formulas when oxidizing biocides are required to maintain a properly running cooling tower or boiler. For closed systems, we offer nitrites and/or molybdates in combination with organic inhibitors to insure multi-metal corrosion protection. For boilers, there is a wide choice of individual treatments, each targeted to a specific control parameter, or blended for easier application. Other formulas include phosphates, chelants, oxygen scavengers and neutralizers, alkalinity enhancers, polymers/dispersants and volatile steam/condensate return line chemicals, in various combinations, tailor-made to boiler makeup characteristics. Blends are available which meet FDA requirements for use in food and dairy plants; many are also authorized for use in USDA-regulated food plants.